More than just self defense, Kung Fu can become a rewarding part of your everyday life. What Is Kung Fu Life? The term Kung Fu Life was coined by Grandmaster Moy Yat. During Moy Yat's training, he spent a considerable amount of time with Grandmaster Yip Man outside of the Kung Fu school drinking tea, going for walks, and caring for him. It was in these moments where Moy Yat learned a great deal about Kung Fu by spending time with his Sifu in these everyday moments. Alternatively, this also allowed him to understand how Kung Fu could be applied to life. 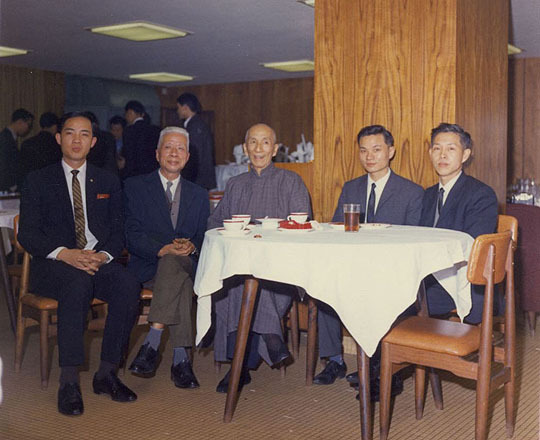 Grandmaster Moy Yat with Grandmaster Yip Man in Hong Kong. At Montgomery County Kung Fu, we continue the tradition of Kung Fu Life. Students have the opportunity to spend time with their Kung Fu family outside of the school, fostering relationships that can last a lifetime. Additionally, we continue the practice of several cultural norms that have been passed down to us in our Kung Fu family; taking care of one's Sifu, Hung Bao (red envelope/lucky money), helping around the school, etc. There are many lessons here that go beyond physical Kung Fu. Discipline, selflessness, humility, respect, and much more, these lessons can permeate into one's personal life and help make them a better person. Many students are also often surprised by how Kung Fu Life can positively affect their physical Kung Fu by spending time with and caring for their Sifu. Observing how a Sifu who lives the Kung Fu Life approaches relationships and situations can lead to many epiphanies and moments of self-discovery.